“I have always been a grapefruit fan so I wasn't daunted by the thought of having them every day - I think it is a good way to start your day and I didn't get bored ( I thought I might!). “Prior to starting the challenge, I thought I may suffer from grapefruit overkill having them every day but this wasn't the case. I had the whole grapefruit and a slice of wholemeal toast every morning and found by day three or four I no longer wanted butter on my toast, which was a positive thing. “I felt full and refreshed - less likely to dive into the biscuits at 11am. I loved the taste of the grapefruit and also the smell - I don't usually have so many in the house at one time and it was a wonderful, healthy fresh aroma. “I felt positive every day of the challenge, great to have one of my five a day before I left the house, and having a healthy start to the day helped me to be strong and resist the biscuit/cookie fix I often get. “I had often enjoyed having sweet grapefruit for breakfast or before a meal. I hoped to lose a bit of weight during the challenge and maybe help to cut down my cholesterol a bit. I enjoyed the taste of the grapefruit – they were pleasantly sweet, fresh and enjoyable every morning. “After eating them I did not hanker for biscuits or 'naughty' snacks, so it freshened my taste buds. “Thank you for the South African grapefruit test trial. I loved it. I used to eat a great deal of grapefruit but got out of the habit. I am right back in the habit now. I found each morning I looked forward to my grapefruit and sometimes in the afternoon around 4pm I had another. “I found it affected my other tastes too, I 'craved' salads and green crisp leaves and less meats and fizzy juices. My taste buds definitely altered a bit. 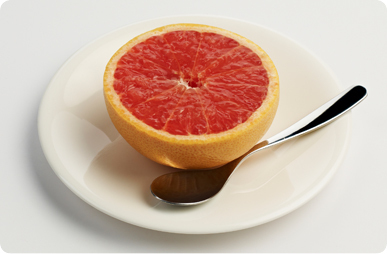 “Prior to the challenge I viewed grapefruit as a diet food so I didn’t eat it often. I had no expectations from the challenge but was interested to see if this alone could produce any weight loss - but I was quite sceptical as my excess seems to be solid and stubborn! “I was surprised to find that I had more energy, my skin seemed to be less prone to acne and a little brighter. I didn’t lose any weight but that was possibly because I often had the grapefruit as an extra breakfast food alongside my usual bowl of cereal.